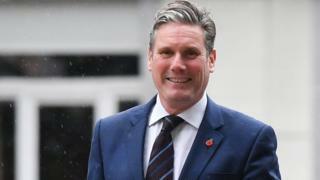 Labour’s shadow Brexit secretary Sir Keir Starmer has said the government’s threat of leaving the EU without a deal is a “political hoax”. He said Parliament must “take back control” instead if the government’s plan is rejected by MPs. “There is no duty on MPs to surrender to a bad deal,” he writes in the Sunday Times. A Downing Street source said the government aimed to secure an agreement with the EU soon, but not at any cost. Any deal reached between the government and the EU is likely to have to rely on the 10 votes from MPs in the Democratic Unionist Party for a majority in Parliament. Labour confirmed its willingness to vote down the agreement and a key DUP MP also sounded a warning. Sammy Baker, the party’s Brexit spokesman, has written a opinion article together with Steve Baker, a Tory MP who is deputy chairman of the pro-Brexit European Research Group. In the piece, the duo rejecting the current plans. They say that the arrangements for avoiding a hard border with the Republic of Ireland are a “humiliation” because they either tie the UK to EU rules or split the country. “If the government makes the historic mistake of prioritising placating the EU over establishing an independent and whole UK, then regrettably we must vote against the deal,” they write in the Sunday Telegraph. Voting against the deal would mean leaving the EU without any agreement at all, the government has warned. But Sir Keir said the prime minister’s attempts to “threaten rather than persuade” would not work and Labour is prepared to reject the government’s plans. “Labour will stick to its guns. Supporting a bad deal is not in the national interest,” he said. Instead, he said that MPs would be able to table motions, press amendments and trigger a no-confidence vote in order to prevent the UK leaving without a deal.